With the help of our experienced engineers, we have been able to manufacture and supply a wide range of single phase And Three phase Geared brake motors. These are acknowledged for their durability and optimum performance. We strictly follow international industrial standards to manufacture these motors and ensure durability and robustness of our motors. Our motors are admired for their perfect design and excellent finish. 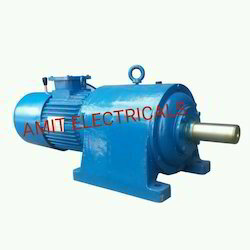 Amit Electricals Manufacture suppler and exporter Geared brake motor. Industry experience in this field enabled us to provide a wide range of Geared Brake Motor to our reputed clients. We are Manufacture, Supplier and Exporter of Geared brake Motor India and abroad. The offered motors are widely applicable and demanded. Geared brake Motor is Combination of A c Induction motor, Gear With Brake. Amit electrical has excellent technological strengths and production facilities. Looking for Geared Brake Motor ?